For over a decade, the three singles off MGMT’s debut album— “Kids,” “Time to Pretend” and “Electric Feel”—have been entrenched in the common lexicon of popular culture, appearing in dozens of movies and television shows. But then their two follow-up albums have been mostly forgotten about due to an intentional aim to be unfriendly to the general audience; however, for their newest album, “Little Dark Age,” MGMT set themselves back on track for mainstream success with a return to catchy pop tunes, but this has only bolstered their sound. The album’s opener, “She Works Out Too Much,” immediately draws the listener in with a cascade of synthesizers playing a bouncy, descending melody accompanied by the voice of a woman giving instructions. It sounds as though it could be on the soundtrack to some infomercial fitness training video with the backing bass synth keeping the rhythm pumping, and combined with several constant tones lowering in pitch with the harmony, the track melds all its components well. Second on the list is the title track, “Little Dark Age,” and as the title suggests, the tone shifts into a darker mood here. The instrumentals and vocals both have a chilling effect with the echo that they employ—most notably during the intro, verse and bridge sections of the song. For the choruses, they still have their overdriven, extended chords as opposed to melody for their instruments, as per the pop standard. But it works fine here and flows well into the next song. The best song on the album is “When You Die.” To begin the song, the rumbling undertones of the bass complement the sharp tinges of the lead keyboard and guitar, both of which quickly build up with a faint drumming until the tension is cut by the short pause when the singing comes in a shout. While the song’s sections change, so does the overall timbre and the way it happens so seamlessly allows the freshness of the song to last. For lasting questions to think about, the lyrics also hint at deep, existential thoughts that one might come across in their life. Despite all those good qualities, the main draw of the song is the part where they sing expletives and one cannot help but to chant along. Because no ’80s teen drama movie is complete without a ballad of synthesizers played during school dance in the gymnasium, MGMT provides a track just for that in their dark, ‘80s-reminiscent album: “Me and Michael.” The song is littered with horns and ‘whoas’ that work to fill out melodies while an arpeggiated synth add steadily plucked bass hop in to hold the feeling of the song together. Much like someone who experienced adolescence in the ‘80s as well, MGMT also has a song addressing the addiction that many people have to their cellular devices in “TSLAMP,” an acronym meaning ‘Time Spent Looking At My Phone.’ While still cohesive with the theme of the album, “TSLAMP” is rather underwhelming of a track when compared to those that have come before it. Similar to “Me and Michael” is another song, “One Thing Left to Try,” but this one is much more triumphant in both musical style and lyricism. The leading melody is a high-pitched, twinkly synth with an ascending line. The lyrics that a woman (and then the rest of the band during the coda), sings along with the song implore the listener attempts to live their life in a manner that will give those they care about a positive impression about themselves, especially when life seems hardest. 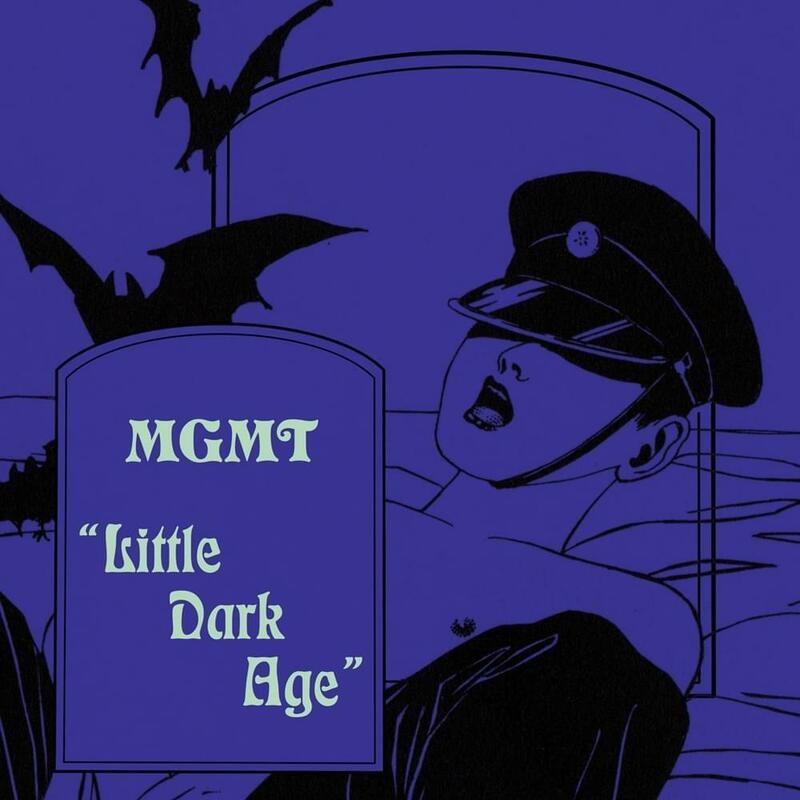 MGMT have revitalized themselves with “Little Dark Age,” so much so that they have come to produce their best work so far. For fans of Ariel Pink, who worked extensively on this album, and other contemporary psychedelic pop artists, this album is a must. Even if one does not necessarily consider themselves a fan of those specific things, it is definitely worth listening to if they like pop music in general, and especially so if they like keyboard synths.